What if the person you were meant to be with could never be yours? That question is one of many I encountered while reading Fallen by Lauren Kate. After reading Fallen numerous times, I have come to the conclusion that this problem is presented quite often in young-adult literature, especially in the paranormal romance sub-genre. However, never in my literary journey have I ever experienced a love story quite like the one crafted by Lauren Kate. Fallen tells the story of seventeen-year-old Luce Price, an average teenage girl shipped off to a reform school in Savannah, Georgia after the questionable death of her late ex-boyfriend, Trevor. I found the mystery behind Trevor’s mysterious untimely demise to be one of the threads that make up the story, and the question “What really happened to Trevor?” made me want to read faster and faster, to finally reach a conclusion. Fallen is a titanic love story at the core, and the romance between Luce and Daniel, which spans across so many centuries, is one of the most honest and authentic fictional love stories that I have ever encountered. Fallen starts off with a prologue, a scene between Luce and Daniel in Helston, England. Seems normal enough, right? Well, did I mention that the prologue takes place in the year 1854? Yeah, not so seemingly normal after all, is it? As much as I enjoyed the romantic aspect of Fallen¸ the mythology incorporated piqued my interest. As I was reading Fallen, the ideas of reincarnation, soul mates, and fallen angels were encountered, and it all weaved together to create a haunting love story. I loved the dark, Gothic setting of Fallen: Savannah, Georgia. I felt as if the deep South with its murky swamps; old, crumbling graveyards filled with the corpses of deceased historical figures; and haunted history made for the perfect fear factor. The characters of Fallen were one of my favorite parts of the book. I felt as if each character had his/her own distinct personality and characteristics, and they could all stand firmly on their own as characters. I loved Luce, Daniel, Arriane, Penny, and Roland the most and felt myself growing closer with them as the story progressed. I enjoyed the third person perspective of the novel because it allowed the thorough reflection of main characters Daniel and Luce, as well as the supporting characters. One of my favorite scenes in Fallen is chapter eleven, pages 219-221. In this particular scene, Daniel rescues Luce from mortal danger and imminent death by whisking her away from a threatening, monstrous fire and soars a thousand feet into the sky with her in his protective, guarded arms. The last topic I want to talk about is the climatic fight scene towards the end of the book where the fallen angels have a final showdown-type of battle and all hell breaks loose…literally. I loved how Lauren Kate ended the first book of the four-book series with an exciting, fast-paced cliffhanger. Lauren Kate writes with such a rich, driven passion that it’s difficult not to succumb to the spell that is Fallen, which is why it is branded one of my favorite books and such an inspiration in my own writing. 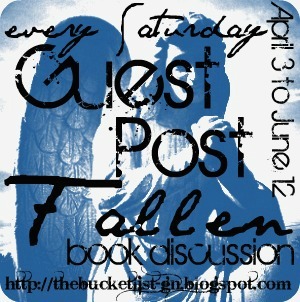 You have just had the lovely time reading Casey's guest post for my Fallen Book Discussion. 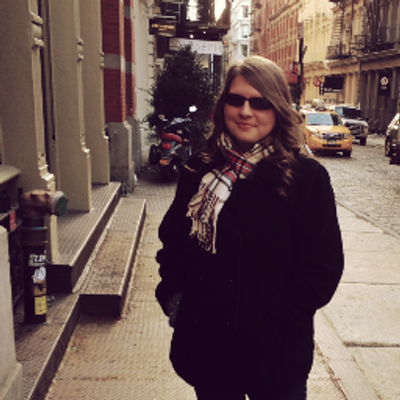 Loved her insight and awesome-ness, well you can check her out HERE. Have you written something about Fallen by Lauren Kate? I would love to see it mentioned in the comments! Thank you, Casey, for joining us today! If anyone else is interested in guest posting something about the Fallen series, please fill out this form HERE. Hope you all have a wonderful weekend! On Monday, I will bringing you my dream cast for the Fallen movie. Grab a copy of Fallen, some snacks, and stay tuned! I like this series. I really have to catch up on it though. I haven't read the third one yet and the 4th will be out soon. Great discussion! I like this idea!